X-Fusion have been around for a while but it’s not until recently that they’ve had much of an aftermarket presence. I’ve reviewed their rear shocks a few times over the times and thought they were great. Now it looks like they’ve finally made some forks that are equally as good. The Vengeance is an air sprung 160mm travel fork with 36mm diameter stanchions and a 20mm bolt-thru axle at the end of its magnesium lower legs. The axle requires a 5mm Allen key to remove/install. The travel is fixed but it can be adjusted down to 130mm or even 100mm by jiggering around internally with the “push-pin ladder system on the air-spring rod”. The fork is available with a 1 1/8th steerer as well as this here tapered version that I’ve been testing over the past few months. After cutting down the steerer it weighs in at 5.2 lbs. The axle-to-crown height is 555mm which is a tad longer than some rival forks. There’s the full range of damping adjustments on offer. Rebound is the very clicky red dial on top of the right hand leg. Independently adjustable compression er, adjusters are at the bottom of the same leg protected by a screw-on metal cup-cover. The blue twiddler is low speed compression. The gold twiddler is high speed compression. Again, they’re nicely clicky. The air valve is located under the black top cap on top of the left hand leg by the way. There are small coil springs in there too to deal with top out and negative travel. It’s an open bath system that’s encapsulated by a sealed cartridge. 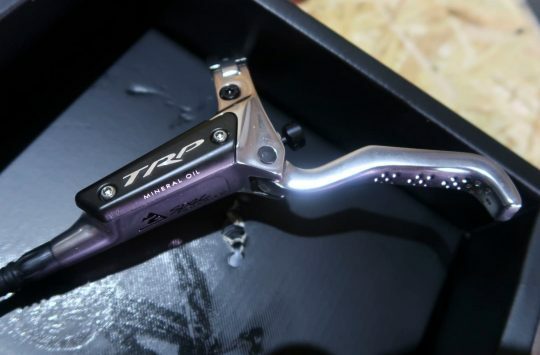 This should offer the benefits of an open bath system (suppleness and consistent damping performance during prolonged rough stuff) without the drawbacks (excessive unsprung weight of having lower legs filled up with damping oil and the likelihood of debris getting into the oil and mucking up the performance). It’s available in white or black. The forks were very easy to setup. The recommended rider pressures written on the back of the leg are, for once, pretty accurate. And the damping is pretty much setup-able in the car park ie. 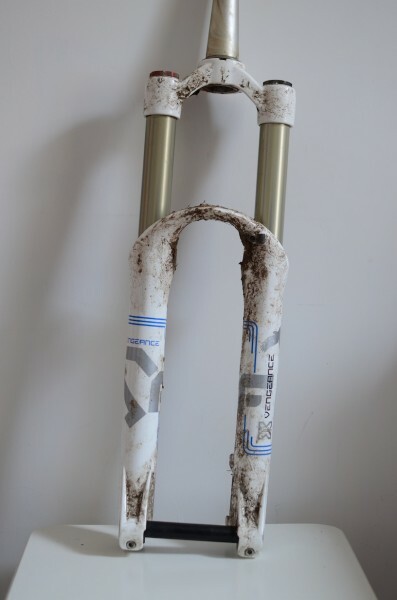 the fork reacts in the same way to a stationary rider pushing down on the bars as it does to a bump from below whilst riding along. Not all forks are like this. There’s less ‘Jedi black magic’ and trial and error required to set these forks up. Get ’em feeling right in the car park and they’ll only require a couple of corrective clicks once out on the trail. And that’s it. Aesthetically the Vengeance looks like a RockShox Lyrik with Fox Float adjusters. Performance wise the Vengeance rides a lot more like the former. The fork is very free moving around the start/sag point, even with a lot of low speed compression (and rebound) dialled in. This took a bit of getting used to as I was coming from a much firmer feeling fork. At first it felt a bit soggy and lacking a bit of pointyness but after a while I learned to just dig down a little bit more into the fork’s travel to hit the ‘pop zone’. Far from being a seen as a problem, I ended up considering the fork’s free-moving characteristic at the start/sag point as a huge plus point. It comes into its own when riding at higher speeds whereupon trail chatter is impressively calmed helping you to keep your desired line and maintain traction. I dialled off some slow speed compression (which put me pretty much in the middle of the adjustment range as I usually run a lot of low speed). I also ended up running a significantly faster rebound speed than usual to further embrace this suppleness. This does have the effect of making the fork bob a bit more on climbs but it’s a price worth paying on an All Mountain fork in my opinion. At high speeds mid to large sized impacts are handled very well with no over-eager flying-through-the-travel nor compression spiking nor any ‘powerball’ rebound moments. It’s a fork that allows you to pretty much ignore the small stuff and concentrate on hitting the bigger, faster, just-plain-more-fun lines. Niggles? The Allen key-required axle is a micro-hassle in these days of QR everything (newer 2012 models should be coming with Syntace thru-QR though). And I guess some riders who like a firm fork for stiffly bludgeoning their way down slow, super-steep technical trails may not get along with the free-moving start stroke of this fork. 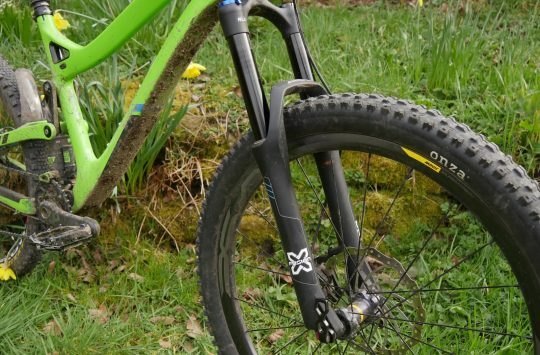 Overall: Great forks for riding fast on rough terrain. Stiff, cushy, capable. Not exactly cheap but significantly less expensive than similar forks from the big brands. They seem to be holding up well too with no bushing slop or worrying noises emanating from inside. 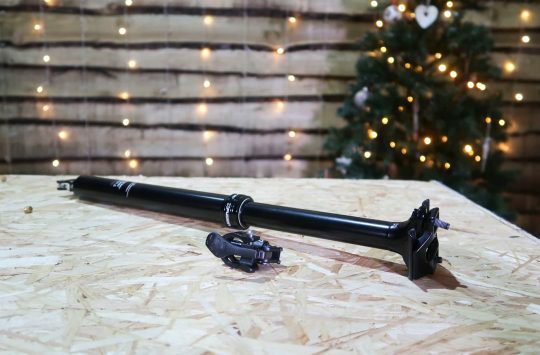 Christmas Countdown Day 12: Win An X-Fusion Manic Dropper Post!